I’m trying to turn over a new leaf. And will be doing so by saying yes to more things. Trying to get out of my comfort zone more often and really push myself to try new things, things I wouldn’t normally jump at the opportunity to participate in. This was put to the test today actually. A couple months ago my friend send me a living social offer for a 5 kilometer color run in Providence Rhode, Island (which is a race where volunteers on the side line throw powdered paint at you while you run). Now let’s get one thing straight here. I am by no means a runner. As in normally don’t run at all but have recently started trying to give it a chance but usually get bored by minute 12 and simply to lazy to motivate myself to go a full 30-45 minutes. And signing up for a race to participate in at 9am on a Sunday more is even more so not my thing. Never ran in a race, and never been a regular daily runner to begin with. But instead of scrunching my face up at the offer, I thought why not, why not try something new, with a friend, see how it goes? Naturally as the day drew near I was kind of starting to change my mind about the whole thing. Waking up at 8am to drive into the city to run for 30 minutes among 1000 other people? Eh… why did I sign up for this again? But then I did it this morning, and it was a blast. The weather was perfect, it was a bright warm sunny October day and the event was a lot of fun. Everyone around us was all pumped up, we were dressed in white, had a nice morning jog with beautiful views of Providence and got some powdered paint thrown around, and then received our own powdered paint at the finish line to throw all over each other. So I’m all about saying yes more often. Yes to new things. Yes to new activities and of course yes to new ingredients. Now I’ve tried kimchi lots of times and really fell in love with it during my two week travels to South Korea in 2012, but I had never cooked with it before. I saw a recipe for a kimchi soup and knew it was time to say yes to kimchi. 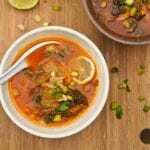 This soup is super simple but packs in lots of flavors. You really feel the kick and acidity of the fermented cabbage and veggies with the salty factor handled by the fish and soy sauces, and a nice refreshing sprinkling of lime juice and zest. All the flavors are tied in together perfectly in this simple yet super tasty chicken kimchi soup. And within 30 minutes you’ve got yourself a steaming Asian themed chicken kimchi soup perfect for slurping loudly. No better time than the present to start saying yes to new ingredients and activities and I’ve kicked that off with a 5K race and some chicken kimchi soup in my kitchen. 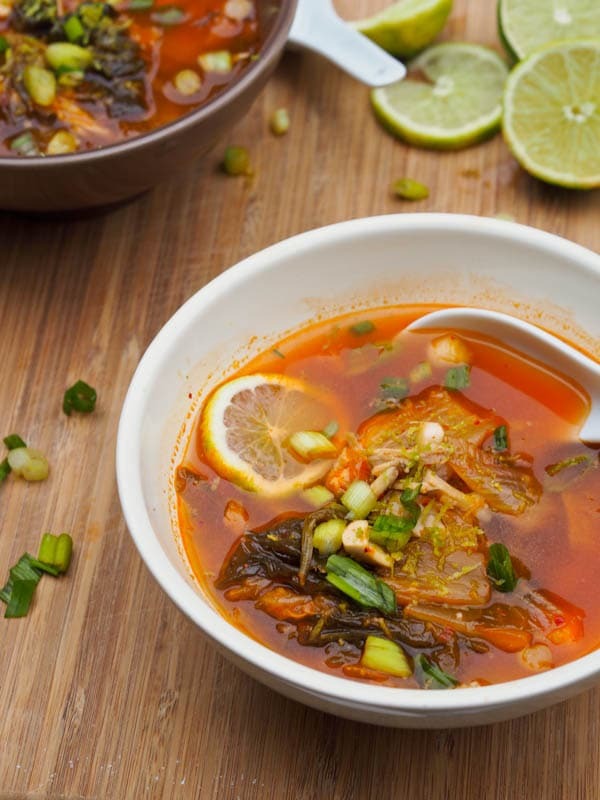 Let me know what you think of this chicken kimchi soup recipe in the comments below! 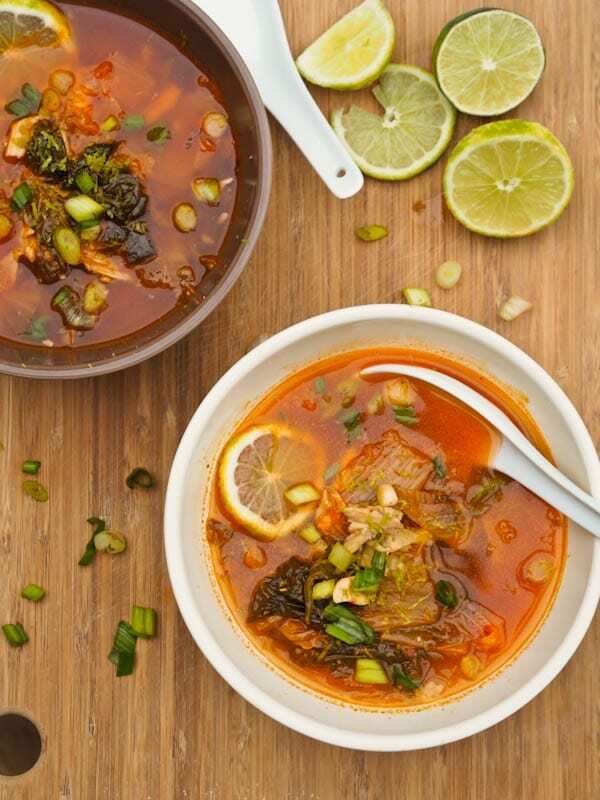 This chicken kimchi soup recipe comes together in under 30 minutes and has an incredible depth of flavors. With a strong Korean kick as well as aromatic garlic and ginger, crispy scallions and tangy lime. Gluten-Free and Dairy-Free. Heat oil in a pot over medium heat and cook ginger and garlic until aromatic (1-2 minutes). Add chicken broth, fish sauce, salt and gluten free tamari. Bring to a boil. Add chicken, kimchi and kimchi liquid. Bring to a boil, reduce heat to low and simmer for 10 minutes. Serve garnished with lime zest, juice and scallions. This may be the perfect way to incorporate Kimchi into a person’s diet. I will have to try, as I know the health benefits are huge. Thanks! This looks spicy and totally delicious! I’m always throwing kimchi into my ramen, might as well make it in a soup too! Thanks Vicky! It is very easy to make and very tasty, I prepared it for girls. It was yummmi. Your Soup looks delicious! Thanks so much for sharing your awesome post with Full Plate Thursday and have a fabulous day! Isn’t 2 cups cut in half just 1 cup..? The recipe calls for 2 cups of kimchi. The kimchi being cut in half (not the measurement). Sorry for the confusion!